While thousands of students return for the 2019 schooling year, Vision Australia is reflecting on the success of its inaugural Melbourne-based school holiday program. The Melbourne School Program which was held over three days in mid-January, allowed more than 10 blind and low vision children aged between eight and 12 years old to learn communication, life and motor skills. 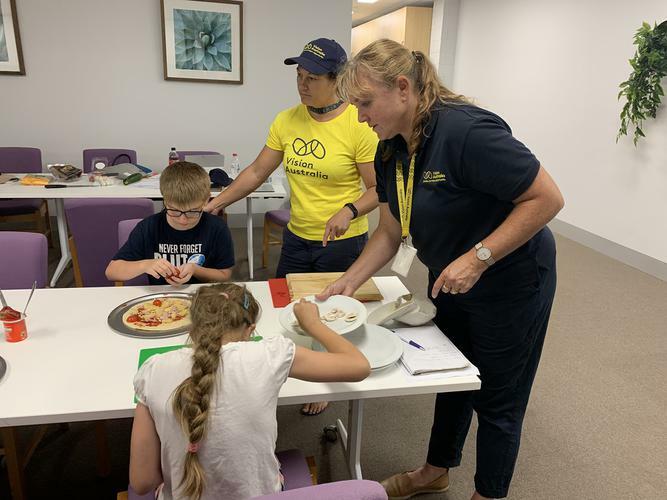 Held at Vision Australia’s state-of-the-art Kensington precinct, the program allowed the students to learn how to purchase ingredients for lunch and cook pizza, alongside valuable road safety skills. Vision Australia’s Melbourne Inner South East Regional Business Manager Emma Wilce says the Sensory Room and the Leigh Garwood Mobility Training Centre at Kensington, proved the perfect environment for the school holiday program. “The program consisted of the sorts of things that many children take for granted as holiday activities,” she says. Ms Wilce says children who are blind or have low vision require some support on approaching the challenges their vision presents. The children also had a go at one of the few sports designed specifically for people who are blind or have low vision, goalball. “Sport is important for a number of reasons, including developing motor, communication and social skills, as well as being healthy,” Ms Wilce says. Vision Australia hosts school holiday programs for children in Queensland and New South Wales and is now planning a similar program for the Easter school holidays.